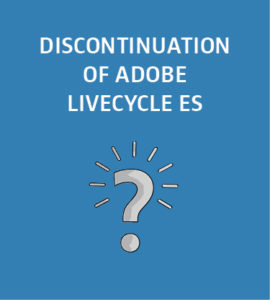 Discontinuation of Adobe LiveCycle ES - What does this mean? Adobe LiveCycle servers are a family of server products catered to the various demands of business processes with heavy document use. Among other things, they automate the diverse PDF functions which Adobe desktop products are known for. Adobe has recently notified its customers and partners that this LiveCycle ES platform will now be replaced by the new platform Adobe Experience Manager (AEM). In this blog post we explain the consequences of this replacement. The features of Adobe Live Cyle ES include the generation of PDFs from MS Office, the filling out and selection of forms, protection through digital rights management (DRM), handling digital signatures, mass mailings, etc. Prostep’s generation of 3-D PDFs from CAD data is also based on this technology. The technology itself is based on a SOA Java platform. SEAL Systems has harnessed the generation of 3-D PDFs especially for customers in the SAP PLM environment, and has also implemented access security via DRM. With the takeover of the Swiss firm Day 2010, Adobe has come into possession of Enterprise Content Management Systems CQ5. Adobe is now positioning this product as a platform for the generation, management and operation of web marketing contents under the name Adobe Experience Manager. At the same time AEM is also building a new platform for the server which until now was known as the solution-neutral LC ES. The familiar LC ES modular structure will not be found in the AEM environment in its old form. Instead, there is now a comprehensive AEM basic package. Many features from the LC ES product palette are now part of a supplement with the name AEM Forms. In turn, the DRM server from LC ES Suite is an optional addition to AEM Forms. A series of further tools for web marketing is offered parallel to AEM: for trend analyses, target group identification, social networks and promotions. Together, this forms Adobe Marketing Cloud. For existing customers of LC ES servers, Adobe is now offering continuation with their current server for 3 years. A separate contract will be concluded for each installation. With the conclusion of this contract, the original licensing purchase with additional maintenance contract will be transformed into a software rental contract, which includes maintenance, at the same price. Within these 3 years the customer must carry out a migration to the AEM platform. During these 3 years, the customer receives the user rights to its already licensed LC ES functionality, but now within AEM Forms. The LC ES of the current version 4 will be announced on March 31, 2018. There shall be no further development to the current operating systems. MS server 2008 R2 is the latest supported Windows platform. We at SEAL Systems will give our existing customers optimal support with the conversion to AEM Forms. For this we have shifted our integration of LC ES to our conversion platform Corporate Conversion Server (CCS in DPF technology) on AEM interfaces. We will soon be providing our existing customers with specific advice on migration. New customers have alternatives to Adobe — for several years we’ve been providing many solutions related to the creation of PDF from diverse formats, including application formats (Office and CAD). Sufficiently high-quality PDFs can be created after the conversion to automation of own-application exports (keyword: tagged). We can likewise carry out the adaptation of existing PDF files to the PDF/A standard with an in-house solution – for all parts and levels of the standard. The newest development offers the creation of PDF/A-2 from nested PDF, Office, image and container files. Our partner Prostep has also placed its own 3-D PDF generator server on the AEM platform. For several years, we’ve been providing solutions for digital signatures with SignLife server from our partner Intarsys. There are alternative solutions for document security by means of digital rights management, which we are currently beginning to implement in projects. The significantly larger scope of functions with AEM Forms naturally also means that its licensing costs are significantly higher than for an LC ES. For all companies who shirk at the high licensing costs or don’t want to go along with Adobe’s comprehensive approach, we can offer alternative solutions. It remains to be seen what will happen with conversion solutions which until now had integrated standard Adobe LC ES, like, for example, Siemens PLM’s Teamcenter Conversion Dispatcher. But with DOC4TC, SEAL Systems offers a fully adequate substitute for this as well. Click here to learn more about our solutions for document conversion.